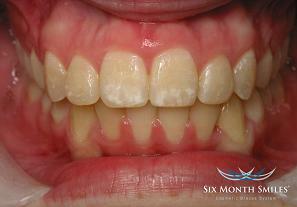 Six Month Smiles is an exciting new procedure that is being offered by Dr. Dilling at Avalon Dental! 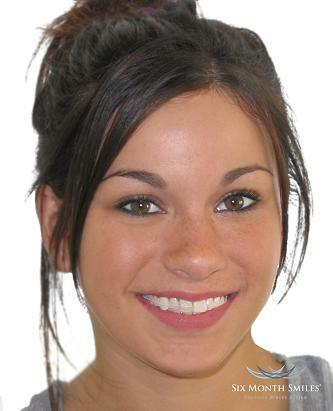 Six Month Smiles is a modern twist to conventional orthodontics, or braces. Adult cosmetic braces is an alternative to traditional comprehensive orthodontics for adults who are concerned with the appearance of their front teeth. Below are some examples of the dramatic change we can make in someone's appearance in a very short time! It's hard to believe that these results are possible in such a short amount of time, but it's very true! For years we have had many patients that have felt like there was not a reasonable solution to treat their smile. Many patients are not willing to complete years of treatment with conventional orthodontics. 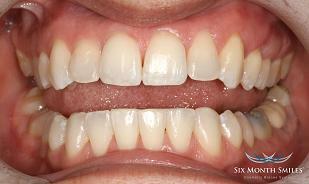 Even more patients did not want their teeth heavily prepared for veneers or crowns. Six Month Smiles is a very attractive technique for many patients because we can achieve incredible results quickly, conservatively, and very affordable! Another attractive aspect of Six Month Smiles is that during treatment patients wear tooth colored wires and braces that give a nearly invisible appearance. 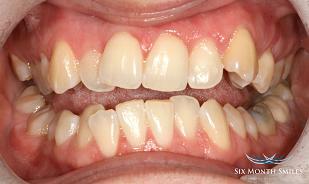 Below is a patient that is in treatment with the Six month Smiles technique, not your typical braces! One of the most frequently asked questions we recieve is "how do you get the teeth to move faster than usual?" The answer is really simple because we do not move teeth any faster than usual braces. The real difference is that we focus on the teeth that show in your smile. These front teeth simply move faster than the ones in the back. We do not significantly change your bite, we focus the treatment on your chief complaint and finish when you are happy. This is a conservative, and affordable option to those patients who have been in "cosmetic limbo" because they did not like any of the conventional treatment options. 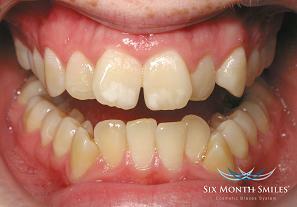 Because we use light forces over a short period of time, Six Month Smiles is also a very safe treatment. We have had a significant amount of interest in this procedure, call now to reserve your spot with Dr Dilling to se if you are a candidate! If wearing tooth colored braces on your teeth for a short amont of time is not an option for you click here to learn about invisalign. If you do not have a dentist of record take advantage of our new patient special, includes all your necessary X-rays, exam and cleaning!